3GP (3GPP file format) is a multimedia container format defined by the Third Generation Partnership Project (3GPP) for 3G UMTS multimedia services. It is a common video and audio format for mobile phones, such as Nokia, Motorola, Sony Ericsson, Qualcomm and more. If you want to view videos either from the internet or your computer on your 3GP mobile phones, you are supposed to convert video to 3GP video format first. This article will show you how to transcode MP4 to 3GP and the same method applies to decode AVI to 3GP, MKV to 3GP, YouTube to 3GP, etc. with the all-inclusive MacX Video Converter Pro. You might have a try on the online 3GP video converter. But one thing you need to note is that the online 3GP video converter is affected greatly by the network connection speed. That's to say, if your Wi-Fi or internet speed is not quite satisfying, your online video to 3GP conversion will be snail slow. 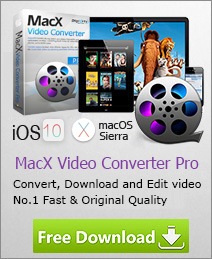 Take MacX Video Converter Pro for instance. It is made especially for 3GP video conversion, which can convert MP4 to 3GP, AVI to 3GP, WMV to 3GP, FLV to 3GP, MKV to 3GP, AVCHD to 3GP, YouTube to 3GP, etc. on MacBook and Windows PC with world's No.1 fast speed (Intel QSV/Nvidia/AMD GPU acceleration tech) so that even though the network speed is not ideal, it can activate your hardware GPU speed to a large extent, 16X faster than any video converter. Moreover, this program also works perfect as a 3GP video downloader to free download 3GP video, movie, music from YouTube, Facebook, Dailymotion, Vimeo, Vevo, etc. 1000+ video sharing sites in batch. Here below will show you the step-by-step guide to change videos to 3GP just a click away (take converting MP4 to 3GP for instance). Free download this top-ranking video processing software and run it, click "Add File" to import the MP4 video files to the program or directly drag the videos to it. Tips: you can preview the video files in the left preview monitor. It allows you to select various output formats. Here we will select "to Mobile" → "PC General Video" and then select "3GP". 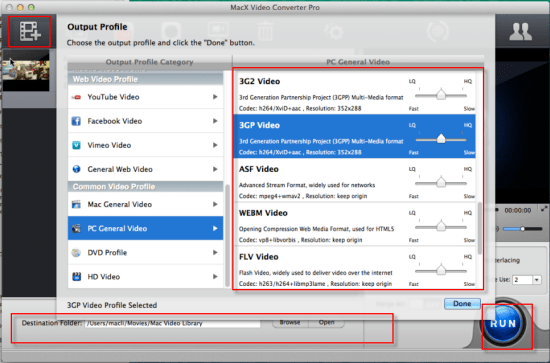 Tips: On top of converting video to 3GP (3GP as output format), it also allows you to put 3GP as input video format, which means you are able to transcode 3GP to MP4, 3GP to MOV, 3GP to MKV, etc. or decode 3GP to iPhone Xs/X/8/Plus, iPhone SE, iPad mini 4/Air 2, iPad Pro (9.7/12.9 inches), Samsung, etc. as you like. Once input and output file are selected, press "RUN" button to start the MP4 to 3GP conversion process. Once the file gets converted, the process will be considered as completed. You can transfer the 3GP file to your mobile phone for enjoyment. Everything is easy. Online-video.com is the ideal place for those who wanna free encode video to 3GP online for free. It lets you free change video to 3GP with local files or just the URL of the video file. Even the video files stored at Cloud storage are supported. Owning it, you can convert video to 3GP, be it MP4 to 3GP with purely 4 mouse clicks. Step 2. Select the size of video. Step 3. Optional settings: in this area, you're allowed to customize your output 3GP files on video bitrate, frame rate, video length, etc. Step 4. Click "Convert file" button to begin the video MP4 to 3GP conversion task.